The definition of the Pythagorean Theorem is a mathmatical relationship of the lengths of the sides in a right triangle - if you square the length of the two shorter sides and add them together, that will equal the length of the longest side squared. An example of the Pythagorean Theorem is a 3 x 4 x 5 triangle - 3 squared is 9, 4 squared is 16, and 5 squared is 25. 9 plus 16 equals 25. "Pythagorean theorem." YourDictionary, n.d. Web. 09 April 2019. 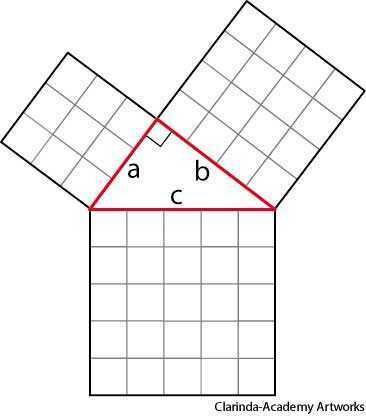 <https://www.yourdictionary.com/pythagorean-theorem>. The theorem that the sum of the squares of the lengths of the sides of a right triangle is equal to the square of the length of the hypotenuse. 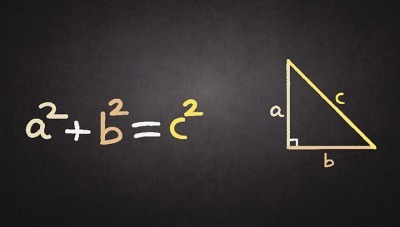 The Pythagorean theorem is a2 + b2 = c2. A theorem stating that the square of the length of the hypotenuse of a right triangle is equal to the sum of the squares of the lengths of the other sides. It is mathematically stated as c2 &equals; a2 &plus; b2, where c is the length of the hypotenuse and a and b the lengths of the other two sides. (geometry) A mathematical theorem which states that the square of the length of the hypotenuse of a right triangle is equal to the sum of the squares of those of the two other sides. The Pythagorean theorem only applies to right triangles. Named after Pythagoras, from Ancient Greek Î Ï…Î¸Î±Î³ÏŒÏÎ±Ï‚ (Pythagoras), Greek mathematician and philosopher who by tradition is credited with theorem's discovery and proof.